Lots of interesting projects are under development at Mingoville at the moment. I think it is about time to give you a small update. One of the projects we will be spending a lot of time on the next 6 months is educational mobile games. We are certain that mobile learning will be a large part of our future. Mobile phones are spreading faster than laptops among our young English learners around the world. Mobile phone penetration in Tanzania and Kenya to mention a few countries is estimated to hit 100% by the end of 2013. We have set a goal to integrate mobile educational games into all our web-based learning universes. Both media have their strengths and weaknesses for educational purposes. The main challenges for our web programs are the lack of adequate IT infrastructure both at schools and in many less developed countries. By developing mobile games, we extend the availability of free English for kids and we give the teachers and the kids an opportunity to learn fun English even though they do not have a laptop, if the WIFI is down or if broadband is not available. However, most of the English mobile games that we have on the drawing board will be 100% integrated with the Virtual World to give the kids a complete experience of mobility and connectivity – the score on the mobile phone can be submitted to the Virtual World and any Mingoville item gained by learning on the mobile phone will be available in the Virtual World as well. It will always be possible to use the English mobile games independently of Mingoville Virtual World. For now, our focus is on developing our math universes for the mobile phones. Our math programs follow the Danish math curriculum for all school kids – both in primary and secondary school – which makes the programs very suitable for a national project this size. 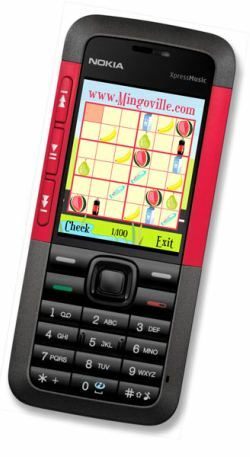 The Mobile Math Library will contain more than 100 educational math games for the mobile phone. It will be distributed nationally to all Danish kids free of charge. The goal is to have all Danish schools to use the free mobile math library in class as a supplement to the traditional math tuition. It’s going to be free to download all the games to the mobile phone either through the mobile web or by texting – the data traffic is sponsored by the large Danish teleoperators. Denmark is our test market – when everything runs smoothly here, we will take the project abroad. The knowledge we gain from the project will also be used to develop more English mobile games that allow the kids to immerse themselves into the language through their mobile phone. We are even looking into how a mobile barcode can be integrated into classroom activities. We have some great ideas that we will share with you later. We expect more English mobile games will be available in second half of 2010. All good ideas on how to integrate the mobile phone into the classroom are welcome – we are always open for suggestions. This entry was posted in Mingoville and tagged educational games, English games, ESL for kids, free English for kids, mobile games, mobile phone application by . Bookmark the permalink. Potete consigliamo di visitare il sito dove ci sono molti articoli sul tema che vi interessa. Wonderfull article I will inform about it my uncle as he is interested in it. Best Regards Bukmacherzy Promocje.